Ninety years ago in the city of San Francisco, a baby boy was born 2 months premature. His parents named him Carol Joseph Flynn after King Carol I of Romania. Carol Joseph Flynn grew up and became the father of Diane Flynn who affectionately called him "Papa." 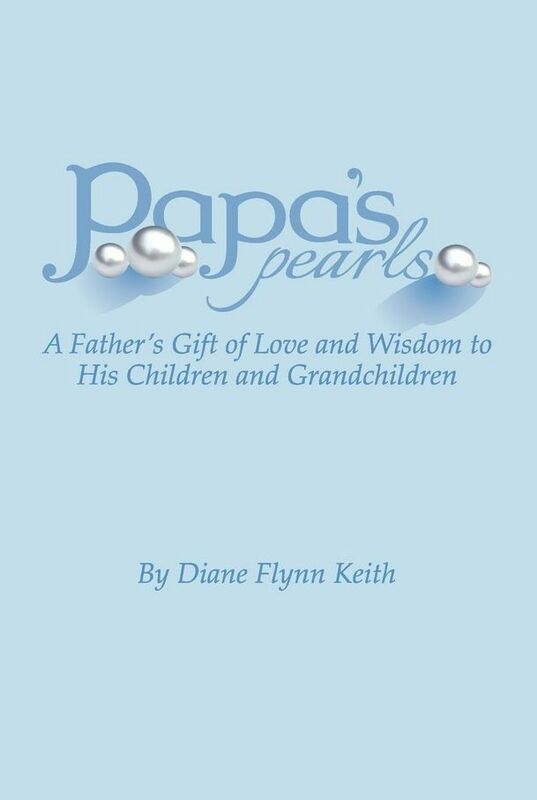 Well, Diane grew up and became Diane Flynn Keith, began a family of her own, and eventually became the author of Papa's Pearls: A Father's Gift of Love and Wisdom to His Children and Grandchildren. Diane Flynn Keith was inspired to write this book after her papa's death in December of 2011. Inside, she shares life lessons and practical bits of wisdom that were handed down to her and other family members by her father. Diane says, "Papa's life was a demonstration of his belief that daily exercise, the power of positive thinking, support from family, and meditation and prayer helps maintain a healthy body, mind, and spirit." "When you fall down -- get back up!" "Tell yourself you like it." "I am so grateful I have a wonderful family -- there are no Kook-A-Loonies." I found it interesting that "Papa" didn't always have it so easy. Early on in life, he experienced much hardship and adversity which led to misbehavior in school and eventually to involvement in criminal activity. What he thought was the worst thing that could happen to him actually turned out the be the very thing that helped him to turn his life around. Through discipline, hard work, and a good attitude, Papa was able to lay a foundation for a successful and happy life. He was a man who put family first, proclaimed his love often, and made life fun. I didn't always agree with all of his tactics, but I liked that he believed that you could learn from both success and defeat and realized that the process was more important than the outcome and that he thought that "believing in yourself is important for success, but it doesn't mean a thing unless you back it up with action." He really seemed like a neat guy, someone everyone would want to know. The book, which is just a little over a 100 pages, was a quick and easy read. Quite enjoyable, too! As I was reading, I could truly feel the love and admiration Diane has for her father. It's obvious that her papa's pearls of wisdom have greatly impacted her life. Her father's love and encouragement have helped Diane become the successful woman she is today. Diane is a veteran homeschool mom who began publishing Homefires: The Journal of Homeschooling in 1992. This resource is now available online at www.Homefires.com. Besides Papa's Pearls, she is also the author of Carschooling: Over 350 Entertaining Games and Activities to Turn Travel Time into Learning Time. She publishes a free e-newsletter, Clickschooling, in which she provides a daily curriculum idea or activity that is available online, and she's also the founder of www.UniversalPreschool.com, a resource to help parents teach their little children (ages 2-5) at home. available for less on Amazon in paperback or Kindle edition. Before I recommend this book, I wanted to point out that there is an expletive included in a quote that may be offensive to some. I think, too, that Papa's Pearls is more for parents (adults) than kids. It could certainly be read aloud and discussed as a family, though. I most likely won't be reading it aloud at this time, but I do hope to implement some of the wisdom shared, especially the part about Papa being an overachiever but having a relaxed personality! If only those two traits could come together for me, I know my family would be especially grateful. :) I try, really I do.